IMPORTANT: If you are a 2.x owner of Pro or Student, you may need to download version 2.4.4 manually. If you are on OS X 10.11 the auto-updater may give you an error. Thank you! Analyzr is available in two versions. Analyzr Student is geared towards individual golfers looking to store and analyze a few model swings in addition to their own swings. Students can track their progress over time, analyze their swings, and upload to YouTube or Facebook. Analyzr Pro provides a fully featured software package - without a yearly recurring fee or subscription - that allows the modern professional instructor to analyze, record, and export and import videos and pictures while working with thousands of students and models. Additional Fees None. Analyzr is not subscription software. Once purchased you own your license outright. All updates from version 2.0 to 2.4.x are free. Analyzr Pro can now export beautiful Swing Sequences of one or two videos. Set the markers for each of the ten frames produced and give it a try! 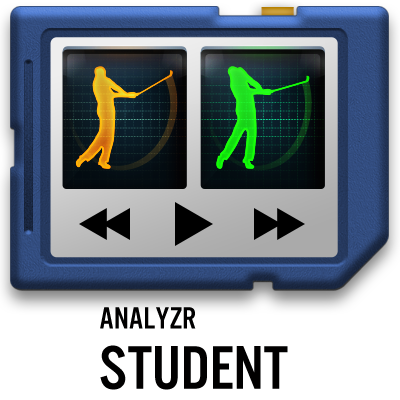 Analyzr Pro can now show the tempo of any swing. Just set Marker 1 at address, Marker 4 to the top of the backswing, and Marker 7 to impact. Analyzr Student can now Trim Video and display videos in Black/White Mode. Analyzr Pro and Student will now play back high-FPS videos (any video over 60 FPS) atmarkers 30 frames per second. This includes videos shot on the iPhone 5S or 6. Supported Video Formats Analyzr will play any video file format that Mac OS X can play, including MPEG-2, H.264, MPEG-4, AVI (Motion JPEG), DV, and more. A complete list of file formats supported by Analyzr is available here. Flip4Mac can add the capability to play back WMV videos. Supported Image Formats Analyzr supports all of the common image formats, including JPEG, PNG, GIF, BMP, TIFF, PDF, and many others. If the bundled "Preview" application can open the image, Analyzr can as well. Data Compatibility The Analyzr Data File is occasionally updated, which renders it incompatible with previous versions. Database upgrades occurred with version 1.3 and version 2.1.2 Any released between these versions are 100% compatible. Older databases are upgraded when used with a newer version of Analyzr. Analyzr Student and Analyzr Pro share the same database format and are always compatible with each other. Live Video Recording - Record five-second clips with a controllable countdown delay from any Mac-compatible USB, Lightning, Firewire, or built-in (iSight) camera. 1 Student and Pro versions share the same demo limitations: Viewers are lightly watermarked (black in Student and white in Pro) and you're limited to loading one video into each of the Viewers per launch. Otherwise both applications are fully functional. 2 Analyzr 1.3 was released November 21, 2011. Analyzr 2.1 was released October 14, 2014. 3 Downloading from YouTube subject to YouTube's Terms of Service. System Requirements: Analyzr Student and Pro require Mac OS X 10.9 "Mavericks" or later. We recommend a Mac from 2011 or later for the best performance. Copyright © 2011-2019 Analyzr Golf L.L.C. All rights reserved.